The Religion Curriculum follows the suggested outline handed down to us by the Department of Catholic Schools in the Santa Rosa Diocese using the Faith & Life textbook series . The general nature of the curriculum is listed below. In Kindergarten we begin with the study of God’s love, how he is the loving creator of all things and, that we are all members of God’s family. A beautiful foundation that will grow as the student progresses in his/her religious life. We focus on the many gifts that God has given to us. We discuss Jesus’ childhood and the ways that Jesus has taught us to care for all of creation. We learn about being positive members of the Catholic Church. 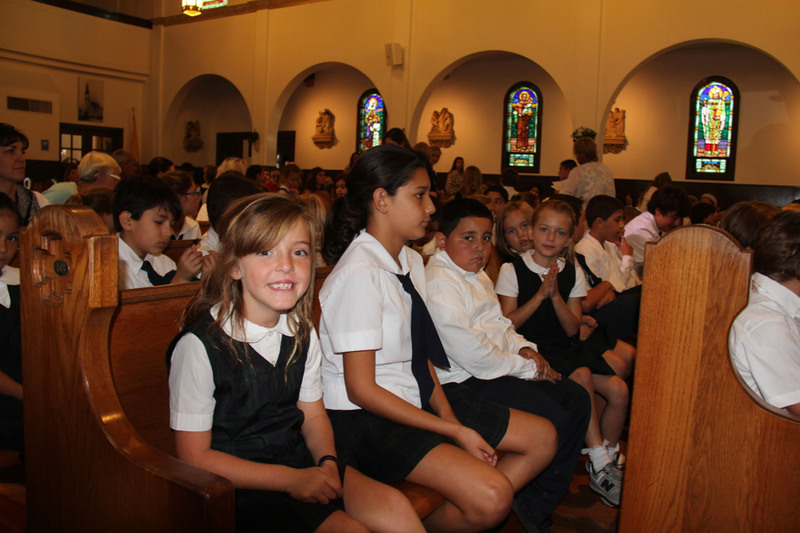 In Second Grade our most important focus is on the Sacraments of Reconciliation and First Holy Communion. We are reminded that when we gather together we present ourselves to God and we are united through Holy Eucharist. Our focus is on the Beatitudes and Ten Commandments, learning correct Bible notation, parts of the Mass, and seasons of the Church calendar. In the spring, we study Family Life using a series that encourages students to continue to be responsible, positive members of their family and community. Parts of the Mass; liturgical year; sacraments; marks of the Church; various prayers; Bible reading; Family Life component. Our focus is on the Old Testament. We follow the Religion Curriculum Student Outcomes set by the Santa Rosa Diocesan Office of Education and the Faith & Life series. This includes performance outcomes related to: Creed, Scripture, Prayer and Worship, Christian living, key scripture references and prayers. Our focus is on ministry to others. We will be discussing the topic of morality and how to live the Gospel values in our lives. 7th graders may prepare for the Sacrament of Confirmation. The focus is the ministry of the Apostles and of the early Church.